Configuring local SPAN does not take a lot of commands. The bigger danger is capturing too much, which risks losing some of the messages and also causing you more work to see the content that you want to see. 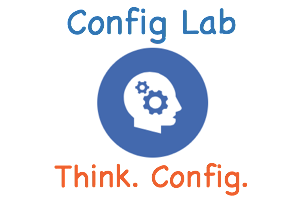 As usual, for these config labs, start by doing the lab for yourself, then check back to this answer post for my suggested answer and some explanation. This lab gives you a primary and secondary goal for what you should capture. There are several ways to capture messages with SPAN to meet the primary goal, and of those, more than one answer would meet both the primary and secondary goal. This commentary works through some of those choices, and then looks specifically at the answer listed here. First, SPAN can monitor for frames being received on the switch port (that is, coming into the switch), frames being transmitted out the switch port, and in both directions. 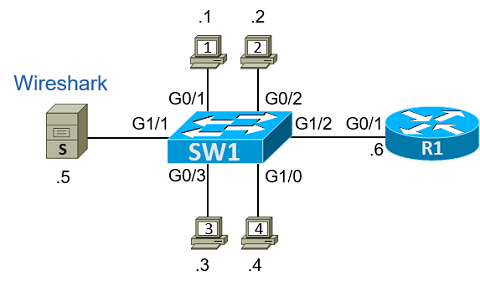 The source can be one (or more) individual ports, or it can reference a VLAN. If referencing a VLAN, the SPAN session performs the capture action for all ports in the VLAN (access ports and trunk ports that support that VLAN). All of these options collect more frames than the frames requested in the primary requirement for this lab. The secondary goal then asks us to capture as few additional frames as possible. For instance, the options that capture all traffic in the VLAN capture frames sent and/or received on the ports connected to PC3 and PC4, and to router R1, none of which is necessary. So the solutions that use individual ports will be a better solution. As you can see from those descriptions, the configuration meets the primary requirement. It avoids capturing known unicast frames sent between PC2, PC3, PC4, and router R1, which reduces the amount of frames captured. But it still captures some extra frames, for example, it would capture frames sent by PC1 to any other device. If I Capture frames in the rx directions only both port G0/1 and G0/2 is that capturing to much frames? Yep! That’s what I tried to state in #5…. but when I re-read it, it even confused me. Short answer: yes.